NASA is working on plans to robotically capture and tow a small asteroid back to Earth's vicinity by the end of the decade, setting the stage for manned visits to learn more about the threat asteroids pose, the resources they represent and to help perfect the technology needed for eventual flights to Mars. "This is part of what will be a much broader program," Sen. Bill Nelson, D-Fl, said in a statement late Friday. "The plan combines the science of mining an asteroid, along with developing ways to deflect one, along with providing a place to develop ways we can go to Mars." According to a mission overview obtained by CBS News, the rationale for the proposed asteroid retrieval project is based on NASA's long-range goals of advancing technology development; providing opportunities for international cooperation; developing new industrial capabilities; and helping scientists better understand how to protect Earth if a large asteroid is ever found on a collision course. The program also would help NASA develop the navigation, rendezvous and deep space operations experience needed for eventual manned flights to the red planet. "I hope it goes forward," said Rusty Schweickart, a former Apollo astronaut who helped found the B612 Foundation, a non-profit organization dedicated to building and launching a privately funded space telescope to search for threatening asteroids. "Asteroids are a very, very interesting area," he told CBS News in a telephone interview. "They're a hell of a resource, and I think the potential for long-term resource development for use in space is going to be a very big thing. And this is sort of step one. It's a baby step in a way, but it should be very interesting." As for the threat asteroids pose to Earth, Schweickart said "I don't want people to spend their nights worrying about getting hit by asteroids. But I do want them to encourage their political leaders to invest in the insurance, which will allow us to prevent it from happening." Aviation Week & Space Technology magazine first reported the proposed asteroid retrieval mission, saying NASA's fiscal 2014 budget request would include $100 million to get the project underway. "Suggested last year by the Keck Institute for Space Studies at the California Institute of Technology, the idea has attracted favor at NASA and the White House Office of Science and Technology Policy," Aviation Week reported. "President Obama's goal of sending astronauts to a near-Earth asteroid by 2025 can't be done with foreseeable civil-space spending, the thinking goes. "But by moving an asteroid to cislunar space -- a high lunar orbit or the second Earth-Moon Lagrangian Point (EML2), above the Moon's far side -- it is conceivable that technically the deadline could be met." Louis Friedman, former director of the Planetary Society and a co-author of the original Keck study, said the proposed mission "is quite an exciting idea" that supports President Obama's 2010 call for sending astronauts to an asteroid. "It turns out, a first mission to an asteroid is still a big step, too big a step, because you'd need a much larger launch vehicle than we're building, you'd need a crew support system that could last for at least nine months in space because of the round-trip time," Friedman said in a telephone interview. "If we have to wait for that, it would be a couple of decades. "But the nice idea here is we can robotically move the asteroid closer to Earth and do the mission as soon as ... the 2020s, the goal is 2025. By moving the asteroid here, we have a much safer, earlier first step for humans going beyond the moon." The mission has "both technical advantages and scientific advantages because we're actually exploring an object instead of going to empty space," he said. "It also has an excitement about it because we get the robotic mission, which is a very interesting idea, moving an asteroid close to Earth ... and then sending astronauts up to visit it." The Keck study estimated a cost of about $2.65 billion to capture and return a carbonaceous asteroid roughly 20 feet across. NASA officials had no official comment Friday and the mission outline obtained by CBS News did not include cost estimates. But the proposed NASA project closely follows the Keck scenario. The outline indicates a three-pronged approach, starting with enhanced efforts to identify suitable targets. The idea is to find a number of near-Earth asteroids roughly 20 to 30 feet in diameter in favorable orbits that would permit capture and transport to Earth's vicinity. "The only real question when you come right down to it is the size, because obviously as you get smaller and smaller and smaller, it becomes more and more feasible to do it," Schweickart said. "As you get smaller, the biggest problem you have is knowing where the heck to find one. We don't have a lot of seven-meter objects in our database." But multiple candidates are needed "because any kind of a schedule slip and that asteroid that you were going to go to may not be back for 15 or 20 years," Schweickart said. "So you need to have a whole set of these things." Along with improving asteroid detection, NASA hopes to start work on developing a robotic spacecraft based on a 30-kilowatt to 50-kilowatt solar-electric propulsion system that could rendezvous with the asteroid, capture it in a bowl-like receptacle and maneuver it back to Earth's vicinity. A "notional" timeline in the mission overview shows a test flight in the 2017 timeframe followed by a rendezvous and capture mission in 2019. The asteroid then would be hauled back to cislunar space by around 2021. Asteroids roughly the size of the desired candidate hit Earth's atmosphere on a regular basis and typically break up harmlessly in the atmosphere. For comparison, the meteor that exploded over Russia in February -- the largest known body to strike the Earth in a century -- was roughly 50 feet across. In any case, the proposed mission outline indicated any effort to move even a small asteroid back to Earth's vicinity would be built around a fail-safe trajectory that would result in a lunar impact, at worse, if anything went wrong. 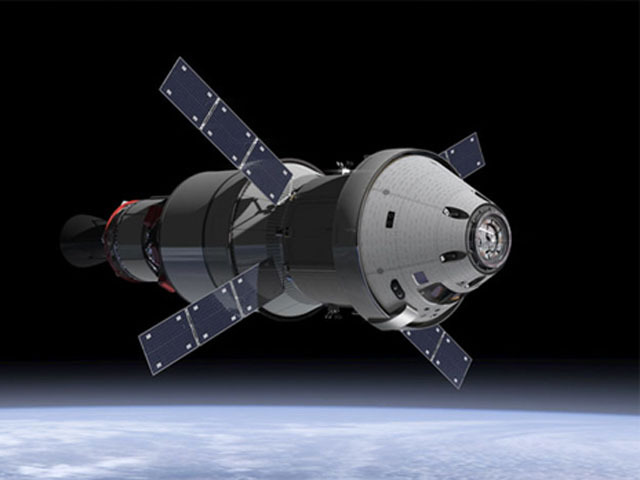 The third element of the proposed program would utilize NASA's Orion crew capsule and a new heavy-lift booster to ferry astronauts to the asteroid for an up-close examination and sample return. Two NASA teams currently are studying the proposed mission. One is focusing on identifying suitable asteroids and developing the unmanned systems needed to capture and return a candidate to Earth's vicinity. The other is studying manned rendezvous and sample-return scenarios. "There is much forward work to do to better characterize the cost, schedule and mission requirements, and focus an observation campaign to find candidate asteroids," according to the mission outline. "The study work will be done in FY 2013. Many key out-year elements are already in the budget." Friedman said the proposed mission would be reminiscent of the Apollo moon program, "of having humans go to a celestial object and make measurements that are of interest to various scientific communities." In the wake of the Russian meteor and a larger asteroid that passed close to Earth the same day, Friedman joked, "if you're not interested in asteroids, what are you interested in?"